It’s time to start work on winter designs. Which is very bad on my part because I should have done that during the summer! I have a stand at the Art House annual Affordable Art and Craft fair at the end of November so that’s what has prompted me. I want to extend my existing range, probably by taking the fold-formed leaf designs which are very popular as earrings and creating some brooches and necklaces. 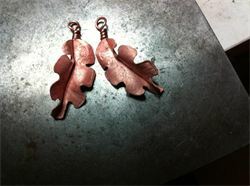 I also want to create a couple of new ‘pocket money’ ranges with stamped copper designs. I went on a great metal-stamping workshop this week at the Bead Hive in the Corn Exchange in Leeds. I had a really good time – learning new techniques always rekindles my enthusiasm. I plan to get stamping this weekend, trying out ideas for an ‘Emergencies’ range and a ‘Zen’ range. More on this soon!